The TaylorMade R11 driver is by far the most anticipated club coming out this year and will be showcased at the 2011 Tokyo Golf Show. The new acronym on the sole of the club is (AST) and it stands for Adjustable Sole Technology. Combine that with FCT and MWT and you got a lot of adjustments your able to make. The satin white finish, along with the black face, creates the maximum contrast between face and crown to help you align the club more easily. Face angle is controlled by an adjustable aluminum sole plate. By moving the red triangular plate into the closed, neutral or open position, you can adjust the look at address. The face settings range from 4 degrees open to 4 degrees closed. The standard R11 driver will come with a 45.75″ Fujikura Blur shaft and retail for $399. A TP version of the club will feature an identical head and several shaft upgrades for $499. Both drivers should arrive in pro shops in mid-February and are available for pre-order. 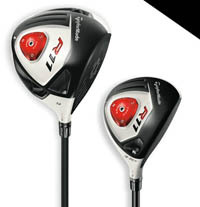 Take a look at some great pricing on the new TaylorMade R11 Drivers.